Original paint or possibly a very old lacquer repaint, I really can’t tell. The jambs, trunk, etc is definately original, original interior, unmolested completely original 60 Impala 2dht 283 powerpack V-8, Automatic, original wheels and hubcaps in the trunk. Identical twin to the 60 Impala that I had in high school, (that I paid $20 for), only without the rust. It runs and drives better than excellent. Has a nice set of old American Torgue Thrust rims, but is now sporting some Corvette rally wheels as I really like driving this old girl and those 14" tires are very old and I have a set of Vette rally wheels with good tires. This car would be a prime candidate to restore partial or complete,or enjoy it just as it is, or I guess you could butcher it like has been done to so many of these beautiful Impalas. I also have a 348 and a 4 speed that would be a nice upgrade......That wouldn’t be butchery would it?? You can restore them a hundred times, but they are only original once. My wife says I have to put a new interior in it before she will ride in it, so it might get a new original interior if I run out of things to do. I recently, (9/13), drove this Impala on a 2,800 mile trip to the now famous Lambrecht Chevrolet Auction in Pearce Nebraska, (where it probably would have brought over $20k if it were in the auction), then over to visit Pa in Southwest Iowa, on out to Eastern Iowa to pick up some parts from Mike, and back to Texas via the Ozarks. It never missed a lick, I ran 70-75 most of the way, got between 15.5 and 17.3 mpg and it took less than a half quart of oil on the trip. 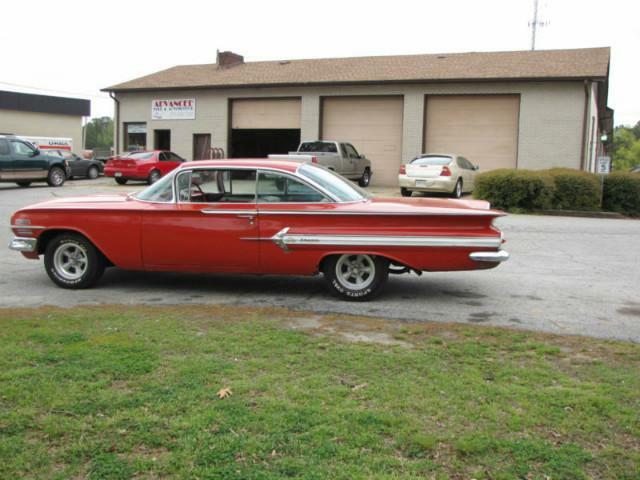 This is a very nice running and driving Impala and is definately ready to drive anywhere.